Heartbeats (French: Les Amours imaginaires) is a 2010 Canadian drama film directed by Xavier Dolan. It follows the story of two friends who both fall in love with the same man. It premiered in the Un Certain Regard section of the 2010 Cannes Film Festival. Francis and Marie first meet Nicolas at a dinner party, where they both feign lack of interest in him. Over the next couple of weeks, the three form a close friendship, meeting up regularly and even sleeping together in the same bed. However, it is clear that both Marie and Francis have an interest in Nicolas beyond friendship. Francis is unhappy when Nicolas invites Marie to the theater. Marie is visibly disappointed when she arrives at a Vietnamese restaurant with Nicolas after the play, finds Francis dining with several friends, and watches Nicolas take a seat at the end of the table furthest from her. Both interpret Nicolas' actions as signs of intimacy and affection: Nicolas eats a cherry from Francis' hand; Nicolas tells Marie he loves her and also loves Francis. Their feelings lead to competition for Nicolas' affections, evidenced by their rivalry over the gifts they buy for his birthday. The relationship culminates in a trip to the vacation home of Nicolas' aunt. Marie becomes jealous when Nicolas feeds Francis a marshmallow, telling him to eat it slowly like a 'striptease', and she goes to bed early. The next morning, she wakes up alone and observes the two frolicking together in the distance. She decides to leave, but Francis chases after her and the two end up wrestling on the ground. Nicolas is not impressed and decides to leave, saying they can love him or leave him. On returning from the trip, neither sees Nicolas. Each leaves him a voicemail message and Marie writes him a love letter. Eventually, Francis meets Nicolas and pours out his feelings, telling him he loves him and wants to kiss him. Nicolas responds: "How could you think I was gay? ", leaving Francis devastated. Later, Marie catches up with Nicolas in the street and first tells him the letter she sent was meant for a female friend accidentally switched with an academic essay she intended for him. Nicolas asks Marie if this female friend is her lover or her ex, which Marie confusedly denies. As Nicolas goes to leave, claiming to have left something on the stove, she asks how he would feel if she had intended the poem for him. He says he would still have something on the stove. After a year, Francis and Marie have re-established their friendship. At a party they repulse an attempt by Nicolas to greet them. In the final scene, they both catch the eye of another party guest and together head for him. Heartbeats received generally positive reviews, currently holding a 74% "fresh" rating on Rotten Tomatoes; the consensus states: "An art film to the max, Heartbeats' intriguing and appealing premise is sometimes buried by director Xavier Dolan's filmmaking flourishes." On Metacritic, which uses an average of critics' reviews, the film has a 70/100, indicating "generally favorable reviews". A New York Times critic wrote that compared to Dolan's first film Heartbeats "takes style even more seriously, both in its allusive execution–he draws giddily from things like the Nouvelle Vague and Wong Kar-wai–and its subject: self-fashioning and teasing, unfulfilled desire." The film won the Sydney Film Prize at the 2010 Sydney Film Festival. 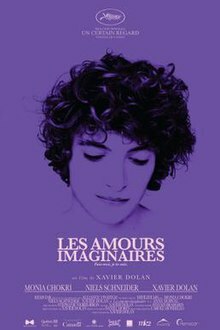 ^ "Les Amours imaginaires - Heartbeats (15)". British Board of Film Classification. January 24, 2011. Retrieved January 23, 2012. ^ "Festival de Cannes: Heartbeats". festival-cannes.com. Retrieved January 9, 2011. ^ Saltz, Rachel (March 12, 2013). "A Mother-Son Dance With Many Awkward Steps". New York Times. Retrieved May 18, 2017. ^ "Heartbeats wins Sydney film prize". sff.org.au. Archived from the original on February 22, 2011. Retrieved January 15, 2011. This page was last edited on 1 November 2017, at 09:06 (UTC).